Can Universal Basic Income (UBI) solve automation-led unemployment? According to reports, Cognizant, the multinational IT giant which has major operations in India, is likely to lay off more than 6,000 of its employees. Though the purported reason being ‘non-performance’, it in fact is part of a wider trend in the IT sector where the ever-increasing automation is making many jobs, especially the lower-end jobs, redundant. There are clear indications that this redundancy is only going to get intensified in future and bad days are ahead for the working class. Research based on World Bank data has predicted that the proportion of jobs threatened by automation in India is 69 percent, 77 percent in China and as high as 85 percent in Ethiopia. Corporate leaders have gained expertise in employing euphemistic language – when they want to lay off workers to reduce their work force they announce that their employees are ‘transitioning out’ which will result in the ‘right-sizing’, of their businesses. Irrespective of the kind of language they use the layoffs are very painful as they deprive people of their livelihoods. Internet of Things (IoT), Big Data, and Artificial Intelligence (AI) have emerged as the most popular technology buzzwords of our contemporary society. There is a symbiotic relationship between these three technologies and they complement each other. Internet of Things, a network of sensor enabled and Wi-Fi capable machines and appliances, produces enormous quantities of data which is analyzed by big data analytics. And the resultant info is used to enable machine learning, which in turn leads to artificial intelligence. These three technologies are poised to truly revolutionize the way we work and lead our lives. These disruptive technologies, though stand as a testimony to the stupendous progress made by the humankind, are capable of ruining the livelihoods of the people and have the potential to trigger massive unemployment. Conventional wisdom has it that large scale unemployment invariably triggers social unrest. Silicon Valley, the leading hub for hi-tech innovation, is working tirelessly to unleash automation all across the world. Once they install the IoT-enabled, Artificial Intelligence (AI) capable robotic hands in the manufacturing facilities, they will need very few humans in their factories. However, the free market capitalists, who are going on an automation spree, are well aware of the consequences of their actions. The windfall profits that will be generated by their automated factories will definitely empower them to accumulate enormous wealth but the people who get elbowed out by the robotic hands will start turning restive. Robert Schmid, Chief IoT Technologist at Deloitte Consulting LLP, asserts, “Like a wildfire racing across a dry prairie, the Internet of Things (IoT) is expanding rapidly and relentlessly”. However, it is not just the technology that has the capability to spread like a wild fire but even the unemployment-induced unrest has the capability to spread in the same manner, albeit with a devastating impact. The corporate leaders all over the world are gearing themselves up for the inevitable. They can’t escape adapting technology, but at the same time they are apprehensive of the likely unrest, which could pose a threat to their business empires. And they are busy devising a ‘social vaccine’ to ward off any negative impact of their automation plans and protect their interests. And the social vaccine appears to be none other than Universal Basic Income (UBI). UBI, to put it in simple terms, is a flat payment made to each and every citizen of a country, irrespective of their socio-economic status, to enable them to maintain a minimum standard of living. The proposal, on the face of it, appears alluring and for many it may even sound utopian. There is a lot of discussion and debate about UBI and the feasibility of implementing it in our country after it found mention in the economic survey 2017-18. UBI is finding favor with left libertarians and free market capitalists alike. The left libertarians, who oppose exploitation, inequalities and concentration of economic power, feel that UBI, to some extent, will ameliorate the hardships of the people who are facing dire poverty. The free market capitalists, who rarely care about anyone other than themselves, have paradoxically emerged as the most vocal proponents of the UBI. Venture capitalists Marc Andreessen and Sam Altman and web guru Tim O’Reilly are some of the top denizens of The Silicon Valley who made a pitch for the UBI. Elon Musk, Founder and CEO of SolarCity, Tesla, and SpaceX, in a recent interview, stated “There is a pretty good chance we end up with a Universal Basic Income or something like that due to automation”. It therefore appears that the free market capitalists have come to the conclusion that the UBI could prove to be the “social vaccine of the 21st century”, which would succeed in mitigating the negative impact of automation-led unemployment. 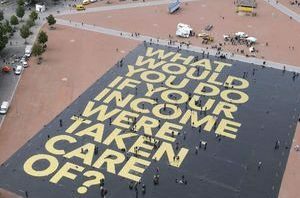 Who will pay for UBI? Payment of UBI, no doubt, will require the mobilization of enormous amount of financial resources. The most likely source of financing UBI is levying additional taxes on the wealthy especially the big business corporations, and cannibalizing the existing welfare programs. In other words, the entrepreneurs who own the robotic hands will be financing the payment of the UBI. This will have serious repercussions on governmental policy making as the corporate interference is likely to increase to intolerable levels. In a democratic world the voice of the people is the voice of God. However, in the emerging world of rampant automation the smart machine-owning entrepreneurs, who will be financing the UBI, may acquire the status of Gods. It will be a dangerous situation, where a handful of people, who own robotic hands, will gain an upper hand over the rest of the humanity and may even push them into subjugation. This article got published as an opinion column in the editorial page of the English daily, Telangana Today on 29th March 2017. 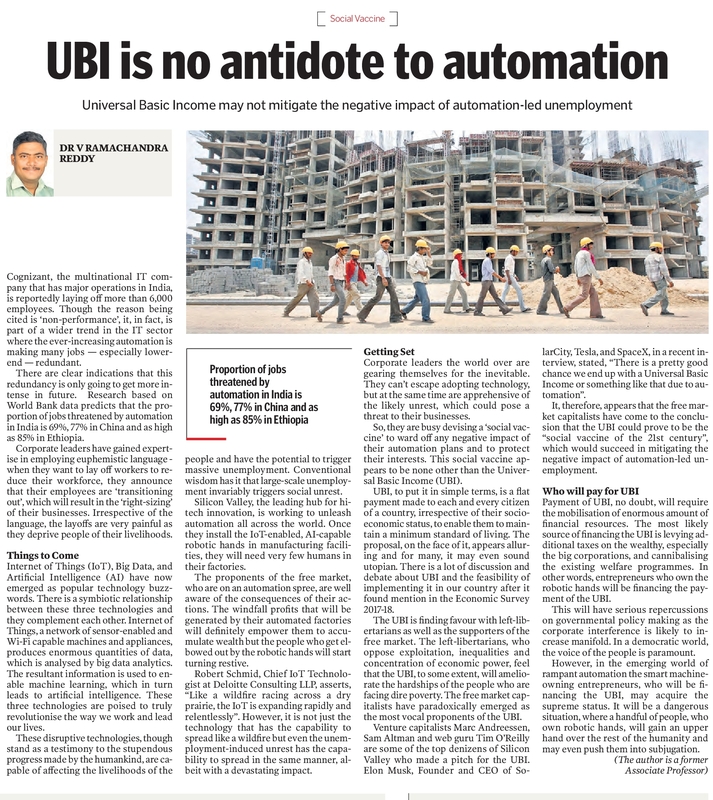 This entry was posted in Society and tagged automation, Universal Basic Income on March 29, 2017 by Dr. Ramachandra Reddy.